The client had a production line that was undergoing a major upgrade in 6 months. The current performance of the line meant that it would be unable to achieve the stockbuild targets by the commencement of the planned activity. Bullant were asked to review the line and provide targetted activities that would accelerate the rate of improvement on the line. We were able to use the insights from these tools to define 10 Performance-Centred Improvements. 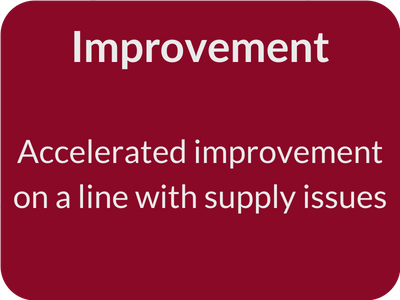 We also prioritised these improvements according to their calculated impact on OEE. The client was able to marshal resources towards the 10 Performance-Centred Improvements. The gains in performance meant that the stockbuild targets were achieved and the refurbishment could take place as planned.